Water is one of the most precious resources yet it is still commonly used as coolant in many laboratories. Most water used as a coolant is not recycled leading to increased laboratory costs. LabTech offers a complete line of recirculating water chillers to match all laboratory needs. The state-of-the art water systems ensure accurate and constant cooling conditions for your instrumentation in the harsh environment of the laboratory. 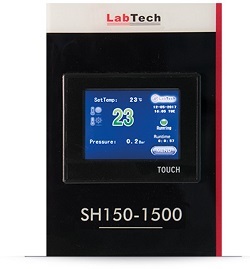 Every Labtech water chiller is provided with an electronic display to monitor and control the temperature via PID technology with a stability of ± 0,1°C in most models. The liquid circuit pressure is monitored and controlled via an analogic pressure indicator. Furthermore every system is provided with a liquid level indicator for maximum safety of operations. All Labtech water chillers are provided with 4 heavy duty casters for easy transportation inside the laboratory. The unit has built in drain to easily remove the liquid from the internal reservoir. Water connections are easily accessible on the rear of the system. Simply connect and go! The internal components of the water chillers line have been carefully selected and intensively tested by Labtech R&D to guarantee maximum performance, reliability and a long lifetime. In addition, Labtech has designed the ‘S’ chiller line to guarantee the minimum level of noise during operation, thus permitting installations directly next to the unit to be cooled. The design also allows for easy maintenance. Labtech water recirculating chillers use hot gas bypass temperature control. Hot gas bypass routes the hot, uncondensed refrigerant back through a reservoir coil thus eliminating on/off cycling of compressor and the addition of energy-wasting heaters. This method coupled with PID temperature control provides a more accurate temperature, greater energy efficiency, and increased compressor lifetime.